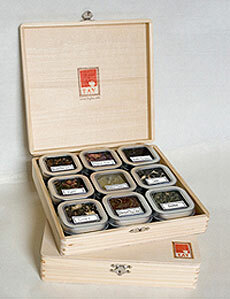 No, that’s not potpourri—it’s the beautiful artisan tea from Tay Tea. 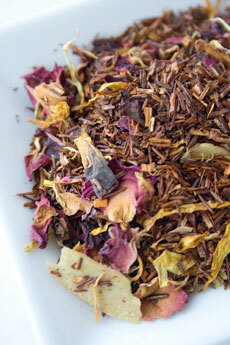 Lovers, above, is a red rooibos blend with Persian saffron, rose petals, hibiscus and marigold petals. Photo by Claire Freierman | THE NIBBLE. This is Page 2 of a two-page Mother’s Day gift list. Click on the black links below to view the other page from this year. Also check prior years’ Mother’s Day recommendations in our Gift Finder and look in any section of our Main Nibbles for Mom’s favorite foods. Prices and product availability are verified at publication but are subject to change. Shipping may be additional. THE NIBBLE does not sell products; these items are offered by a third party with which we have no relationship. They have been recommended because we think they are outstanding products. 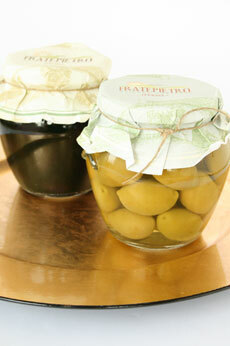 The cultivation and manufacture of the Bella di Cerignola olive dates back to a forgotten pre-Christian age. It is distinguishable by its oval shape, larger than other varieties and by the ease with which the flesh separates from the stone. These Italian olives are firm and fleshy, with a sweet, elegant, rich taste that lends well to eating plain, adding to antipasto...or making a very special martini! Deluxe olives. Photo by River Soma | THE NIBBLE. Healing Cooler produces delicious fresh-squeezed juices designed to pinpoint a specific healthful asset, including Immunity, Strength and Recovery. You can choose your own combo pack based on diet or favorite flavors. 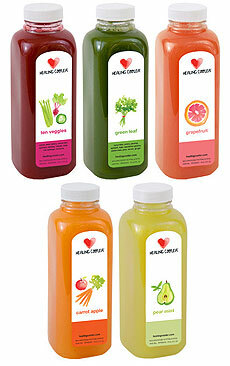 The juice is extracted from fresh fruits and vegetables using a hydraulic press, which retains more vitamins, trace minerals and enzymes than other juicing techniques. 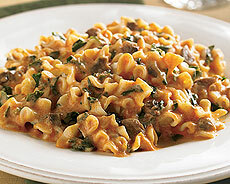 The result is a fresh and vibrant flavor with a fine and pulp-free texture. Who wouldn’t love a case of these healthy treasures? Healthy juices. Photo courtesy Healing Coolers. Send Mom a gift card to Schwan’s Home Delivery. With more than 350 choices, from miso cod to lasagna, Mom will be able to enjoy delicious dinners via the microwave instead of standing at the stove. The large servings ensure that no on will go hungry, and the quality ingredients make take satisfaction virtually guaranteed. Delivery trucks stop by weekly or bi-weekly. If there’s no Schwan’s route in Mom’s zip code, deliveries can be made by overnight express, with no delivery charge for orders over $100.00. Ready to microwave! 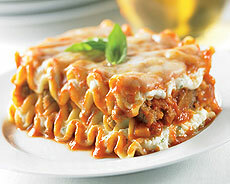 Two of the Nibble Editors’ favorites: Lasagna With Meatball Sauce and Pasta With Spinach & Mushrooms. Photos courtesy Schwan’s. 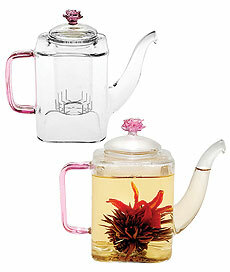 This beautiful hand-blown glass teapot allows Mom to not only watch her pretty floral tea as it blooms, but also keeps it warm between cups. With a pink handle and pink rose crowning its top, this gift is not only functional but serves as lovely kitchen décor as well. The heat-resistant glass is microwave and (top-rack) dishwasher-safe. Packaged with a red ribbon, it makes a delightful and unforgettable gift for tea drinkers or anyone who appreciates quality craftsmanship. The casserole carrier is the perfect way to tote your favorite dish to family parties, tailgate gatherings, friends’ houses or holiday parties. Made with a laminated printed canvas exterior and a bright colored interior, the Casserole Carrier is made to fit a 9x13-inch dish or smaller. 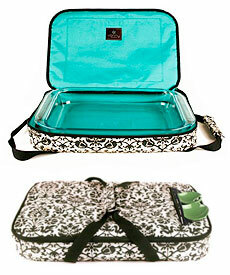 It also features an exterior pocket large enough to hold your serving utensils. And with four fun and colorful prints to choose from, Mom will be the most fashionable attendee at the potluck! © Copyright 2005- 2019 Lifestyle Direct, Inc. All rights reserved. Images are the copyright of their respective owners.